The husband and I celebrated our first married life anniversary yesterday. Can’t believe it’s been 1 year! Time sure does go by really fast when you’re enjoying it. He is definitely everything I’ve ever wanted in a husband! We celebrated our one year walking around Disneyland/CA Adventure and had a wonderful time at dinner. 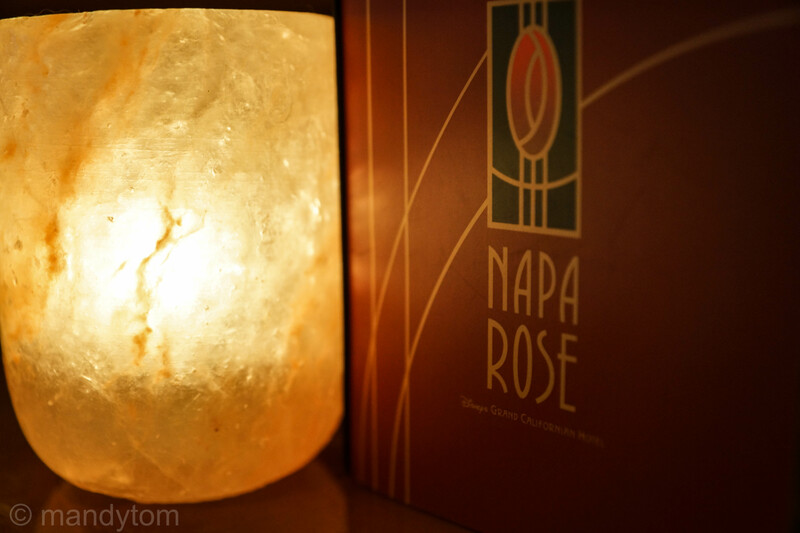 We arrived at Napa Rose 30 minutes earlier than our reservations. The hostess was super friendly and congratulated us right away. She also offered us a spot at the Chef’s Table for dinner because there was a cancellation! WooHoo! Apparently, the usual reservation for the Chef’s Table is roughly 2 months so we were super excited and we’ve read nothing but awesome things about it. We waited in the lounge for a bit while they prepared our table. Everything on the menu looked really good! The hubbie decided to go for the chef’s sampling menu + wine and I ordered the scallops and filet mignon. The chef came over to check on our preferences/allergies and took down our dinner choices. 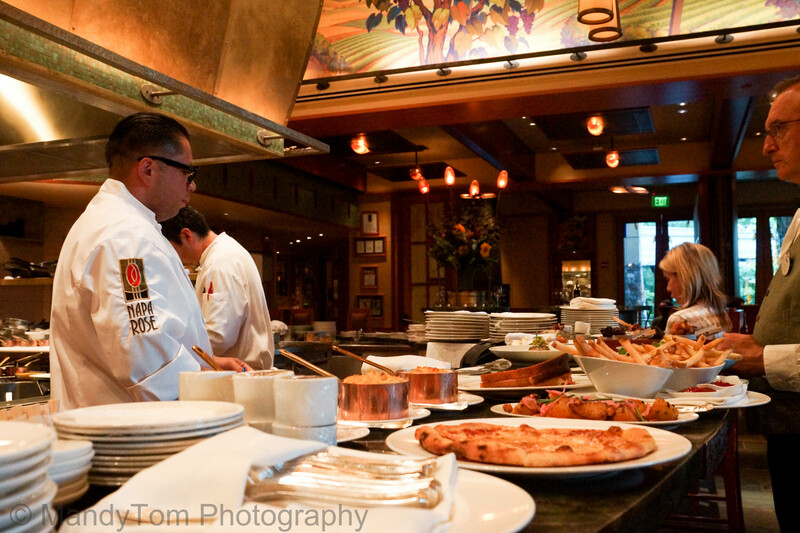 It was extremely awesome sitting in front of so many chefs preparing food! Right in front of me was Chef Danny (left). I tried really hard to pay attention to how he made the salad. He seemed to put so much heart into the food he was making. 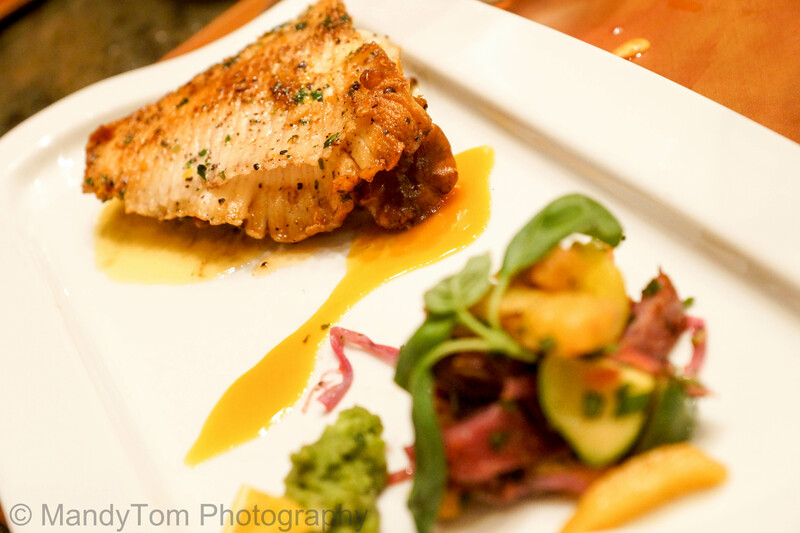 Every ingredient was thoughtfully pieced together on the plate, one by one. Chef Ronnie came over once in a while to help out as well. One of the salads that went out that night, which we had the pleasure of trying as well! 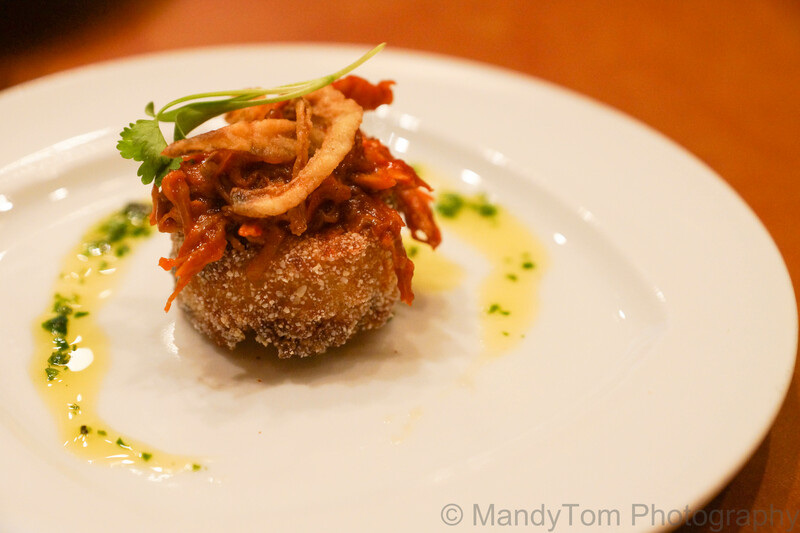 After we munched on some super yummy bread, we both got a little surprise from the chef: Fried rice ball with duck confit and fried shallots. The rice ball was crispy on the outside and just right on the inside. The duck was really savory. Then the husband got his salad that Chef Danny made! 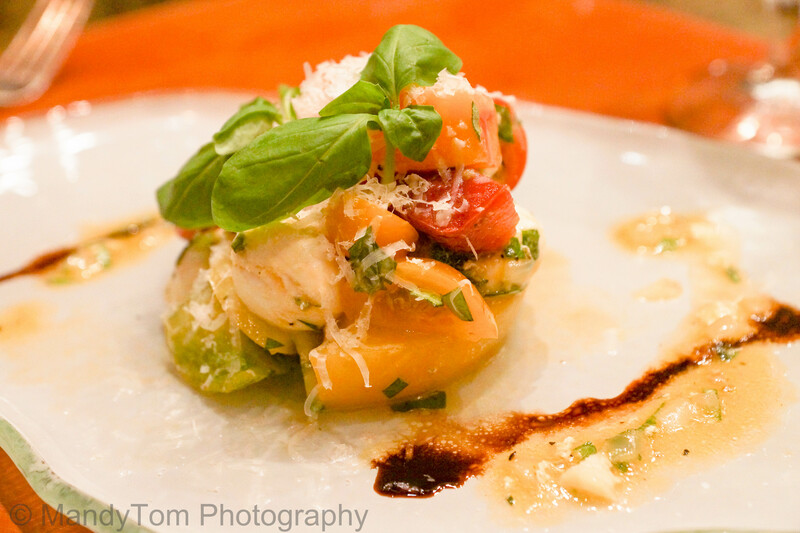 The California Heirloom Tomato Salad (Fresh Lemon-Thyme Mozzarella, Avocado and Sparrow Lane Vinaigrette). I’ve never tasted a salad this fresh!! The chef also told us that they just put this salad on the menu since tomatoes are seasonal and they just came into season. Once they are out of season, this salad gets taken off the menu. I saw a lot of this salad go out that night. I’m not a huge fan of tomatoes but this salad is so fresh and so good, I can eat it nonstop! While the husband was eating his salad (and sharing with me), I also got a small cup of Portobello Mushroom Bisque “Cappuccino” with Brandied Thyme “Froth” to try. 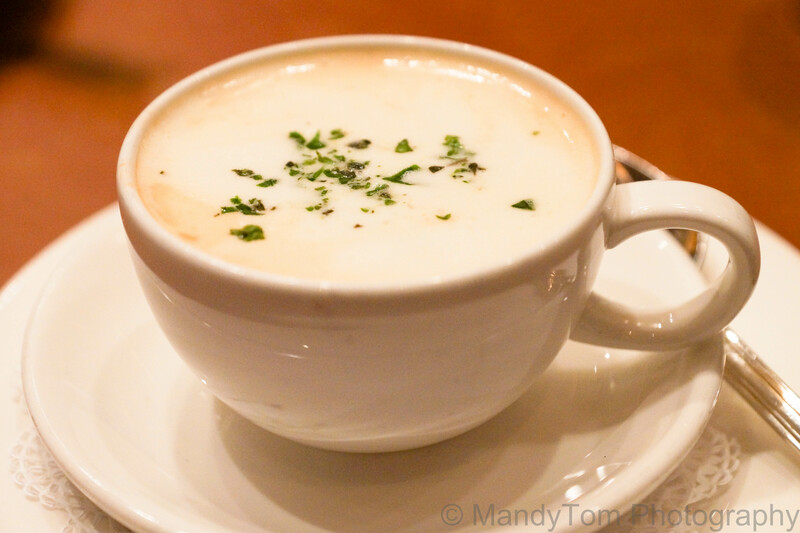 I’ve had many mushroom “cappuccino”s before that were really strong but this soup is JUST RIGHT! I shared with the husband too but accidentally ate all the portobello mushrooms. Oops! While we were eating and waiting for our food, I noticed another chef cooking massive scallops nonstop. They were literally the size of my fists when raw. I tried to pay attention to how he seared/cooked them and one of the chefs also told me how it’s done…will be trying it out at home one day! Apparently the scallops are one of their signature dishes. 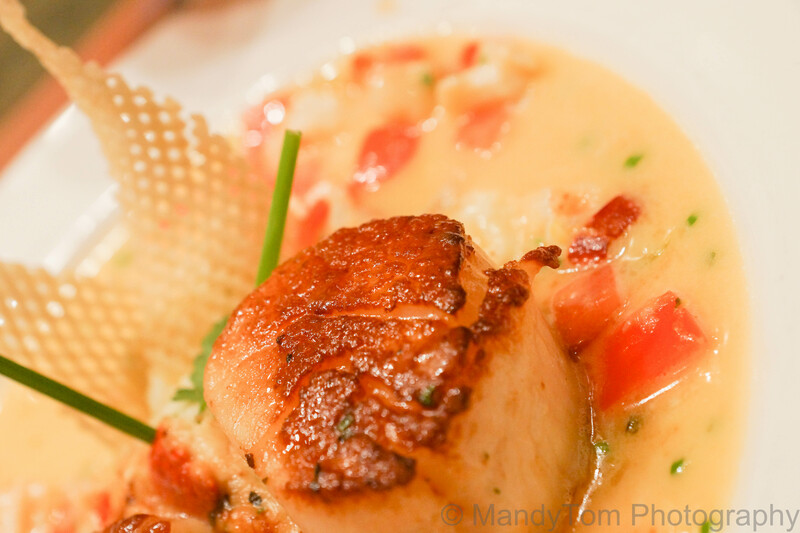 At this point, I couldn’t wait for my scallops but it was only a few moments away! After the soup+salad, our appetizers came. Husband got sea bass with potatoes. 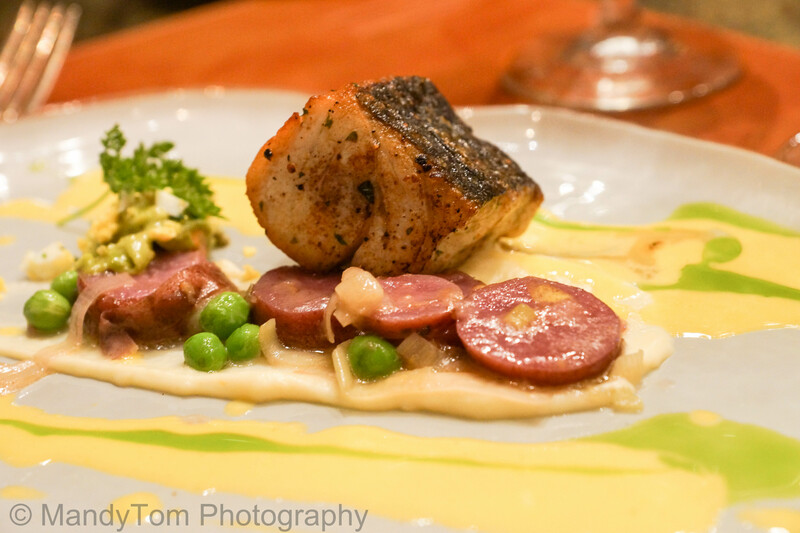 Sea bass is my favorite fish, and of course, this dish did not disappoint one bit. My favorite dish of the night, though, definitely goes to the scallops! 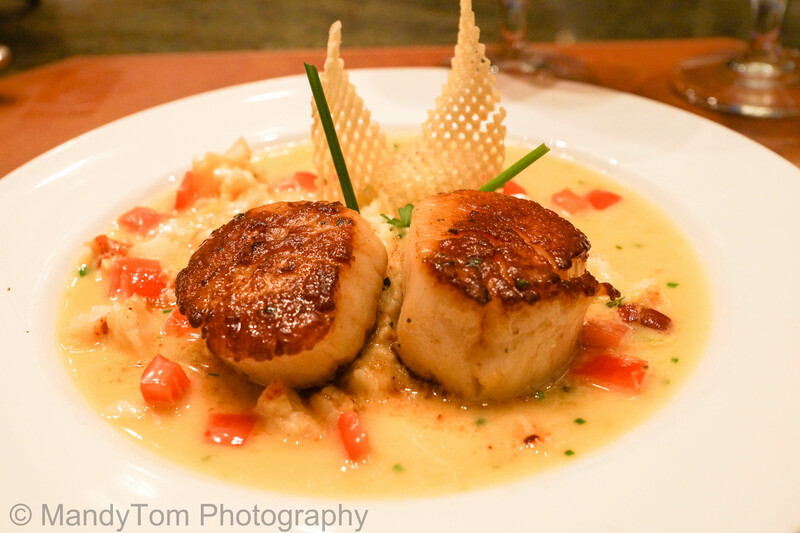 They were Pan Roasted Diver Scallops (on a Sauce of Lobster and Lemon Accented with Vanilla). The scallops were tender and sweet and placed on top of some mashed potatoes. There were also many yummy lobster pieces in the sauce. I will definitely get this again the next time I go to Napa Rose! I was sitting next to the pass as well and got to see all the food that went out to everybody. A lot of people ordered the mac n cheese and it looked heavenly! 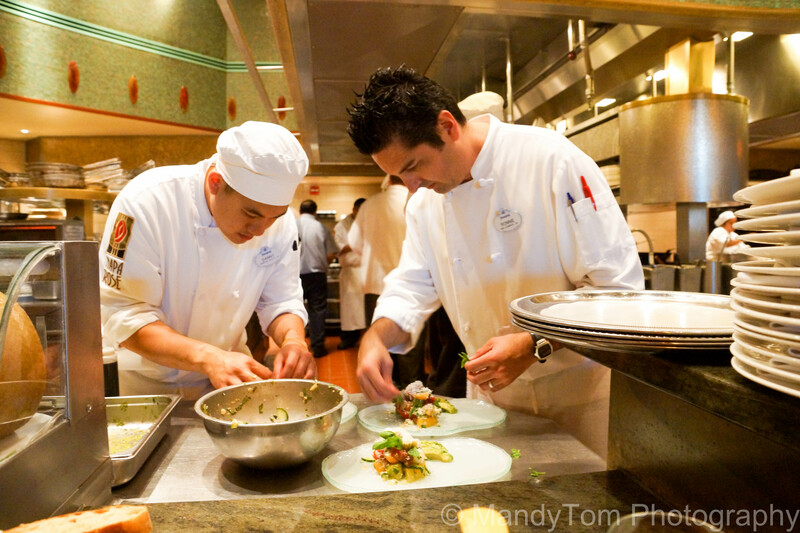 Here’s Sous Chef Juan at the pass. 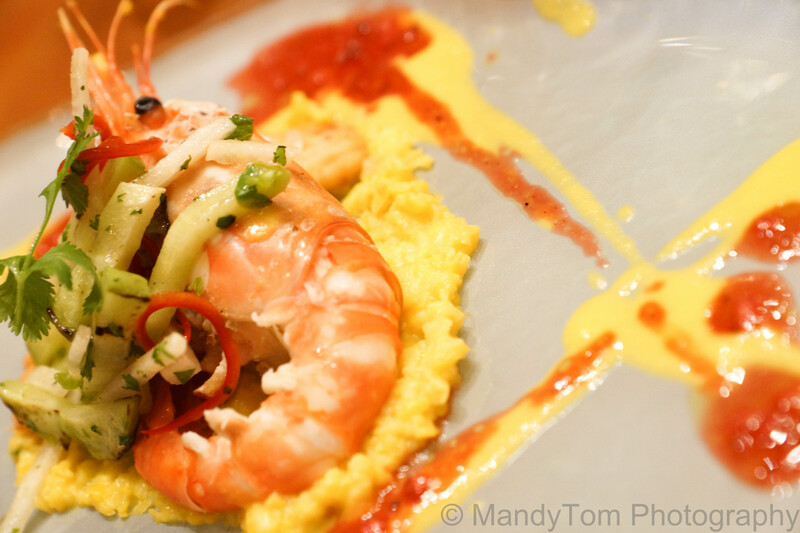 Next up was my husband’s Salt Roasted Santa Barbara Spot Prawn (Brentwood Corn and Shrimp Turnover with Prickly Pear Vinaigrette). Again, super yummy and on an empanada. I think they said there was more shrimp inside the empanada. 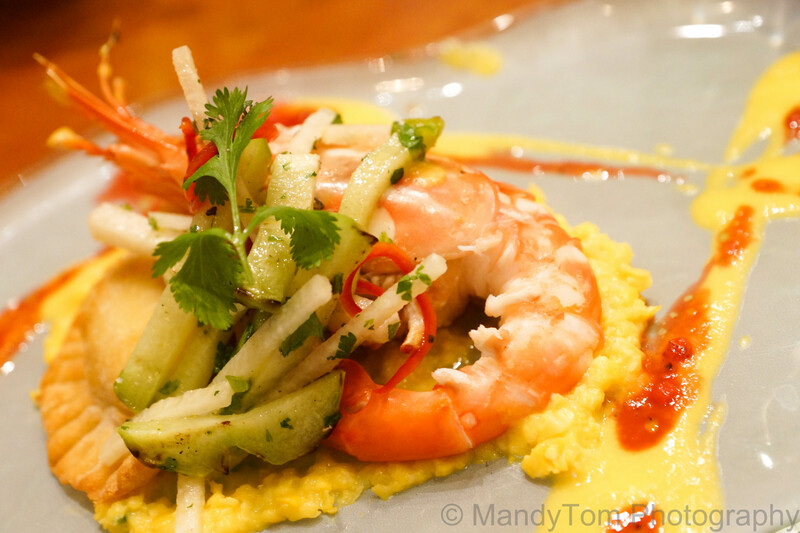 Everything from the corn, to the jicama, to the shrimp are really tasty. 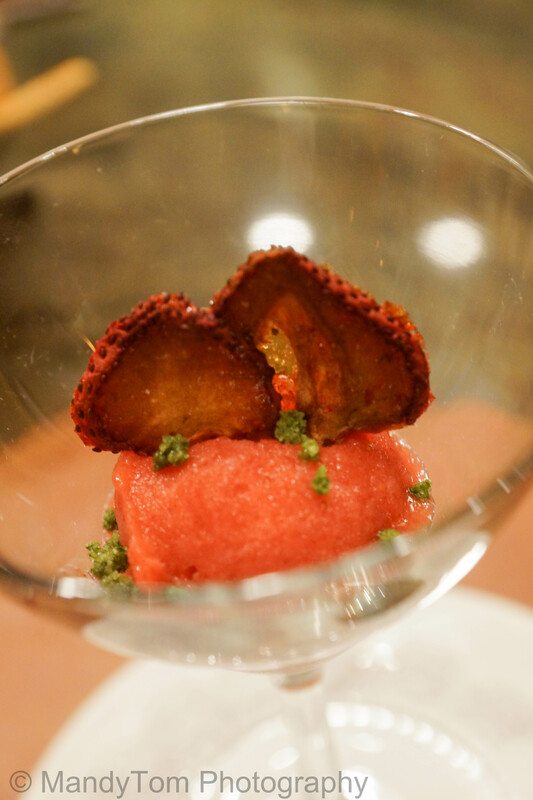 Right before our main entree, we each received a strawberry sorbet with basil to freshen our palate. While I was taking pictures, husband already dug into his. His first reaction was “WOW this is really good…who would’ve thought strawberries would go so well with basil.” So I put down the camera and tried mine. OMG, what an awesome combination. In the car ride home, we were wondering how the little green basil pieces were made. Sugar + basil blended together? Sugar water with basil and then hardened pieces? At this point, I was already satisfied and could go home happy already hahaha. But of course, our entrees! Husband got the Roasted “Bone In” East Coast Skate Wing (Golden Chanterelles, Fava Bean Potatoe Salad with Orange Basil Butter). We both tried it immediately but it was a little on the salty side for our taste. We sent it back and they immediately made another one that was much better and really good. The bone of this fish is really easy to take out. He ate one side of the fish, flipped it over, and ate the other side while the whole bone was still intact. 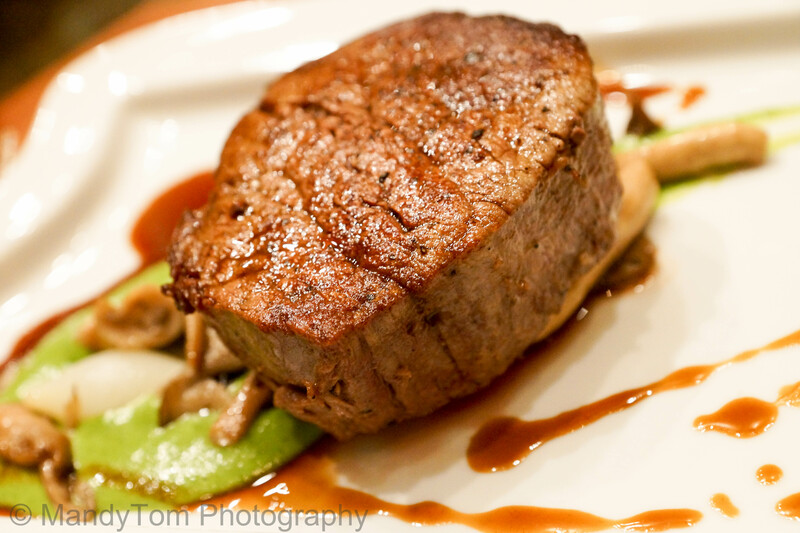 I got the Sauteed Petit Filet Mignon (Sonoma Mushroom, Potato Gnocchi, Green Garlic and Cabernet Essence) cooked medium. You know how sometimes you ask for medium, but you get medium well? I asked for medium and it was medium! Yay! My husband doesn’t eat beef, so I haven’t had steak in a long time. This filet mignon was thick and juicy! MmMmM yummy. The potato gnocchi was good as well. My husband doesn’t like gnocchis but he found these to be really good. Halfway through my entree, I was really full already but it was so good I finished everything! Both the husband and I finished everything and can’t be more satisfied! 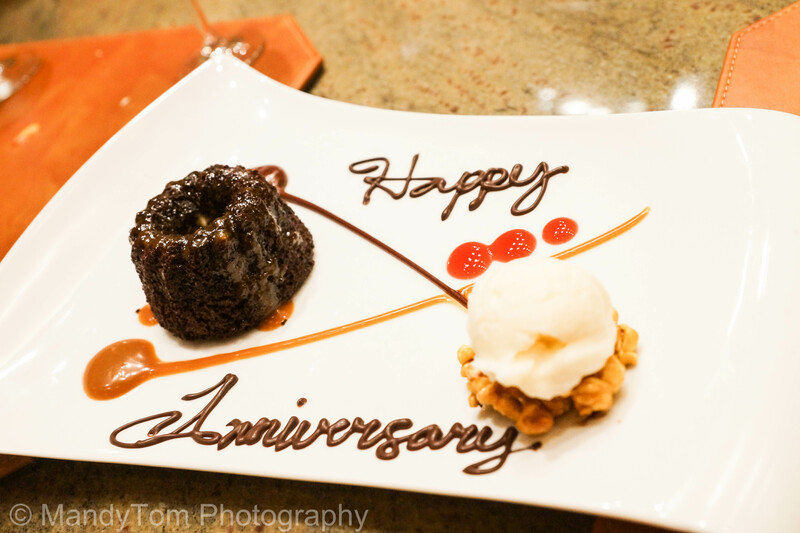 In the end, we decided that an anniversary dinner wouldn’t be complete without dessert! We got the chocolate bundt cake with popcorn flavored sherbet on caramel popcorn. The popcorn sherbet was so good! Just the right tint of popcorn flavor. The plate even had “Happy Anniversary” on it! The dinner was an experience I would never forget, especially with it being on our anniversary! We also got two small boxes of chocolates that were made in-house. The service from the host/hostesses, waiters/waitresses, and chefs was incredible and the attention to detail they put on the food is incomparable. I would highly recommend sitting at the Chef’s Table at Napa Rose!